Open air auto transport carriers cost on average about 33% less than enclosed shipping. Bigger open car carriers can hold about 8-10 vehicles vs about 6 for most enclosed carriers. That mainly explains the difference in cost, though there are other factors as well. Approximately 97% of all auto transport shipments are done in open car carriers. The first decision any customer must make is whether to ship his or her vehicle open vs enclosed auto transport? The extra cost to enclosed car carrier shipping is perhaps the first significant consideration. On a coast to coast open carrier car transport, it may cost roughly $1,000 to ship a regular sedan. Choosing enclosed car shipping might raise the price to $1,500, which is an extra $500. That will give anyone some pause and prompt the question of whether really necessary? Sometimes it is, or should be. 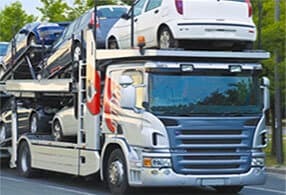 It is usually a binary choice whether to go Open Car Carrier or Enclosed Auto Transport? However, enclosed carriers actually come in two forms but are not differentiated for the car shipping customer. The two enclosed methods are treated as one and the same with the customer being offered no choice between them. However, there is a slight difference worth mentioning. Enclosed car carriers often are hard-side and look the same as moving company trucks or other semi-trailer freight. They are made of tin, aluminum or fiberglass shell. Vehicles inside are completed protected from the outside. 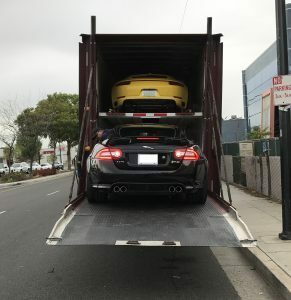 The other type of enclosed car transport are soft-side trailers, which typically have hard shells in the front, back and top, but a soft canvas pulled tight on the sides. It does a good job of protecting the vehicles inside from the outside, but never-the-less some dirt may drift in. What Is An Open Car Carrier? Open carrier auto transport is what you most often see rolling down the highway. It is open air transport, or exposed to the elements. Most car dealerships receive their inventory of vehicles in open car carriers. Being exposed to the elements means rain, snow, hail, dirt and whatever else flying around in the open air. The overwhelming majority of vehicles are shipped open vs enclosed auto transport. Direct Express Auto Transport researched the number of open vs enclosed trailer shipments on Central Dispatch and determined that 97% are open air auto transport. One of the reasons why so many new car manufacturers are willing to ship their inventory to dealerships open carrier is because it is extremely safe. Rarely are there physical damage complaints. And when that happens, it is usually something innocuous. Purportedly, open auto transport damage complaints happen in only about 1/200 shipments, maybe less. 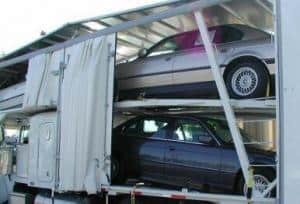 What Is An Enclosed Car Carrier? Enclosed auto transport often goes unnoticed on the highway because the vehicles are hidden from view. The enclosed car carriers protect the vehicles inside from the elements, assuring that neither rain, snow, sleet, hail, rocks or anything else comes in contact. Enclosed transport also means that vehicles arrive in the exact same condition in which they departed. If the vehicle is loaded in clean condition, it will arrive clean too. Enclosed carriers also have the extra protection of drip pans to keep any transmission fluids from getting on the bottom rack vehicles. Only 1/33 vehicles are shipped enclosed car carrier. The cost of car transport open vs enclosed is significant. Enclosed carriers cost typically 33% more than open air carriers. The expense for an auto transporter of hauling either an open or enclosed carrier is roughly the same. But because an enclosed carrier may fit 33%-40% fewer vehicles, he must charge that same percentage more per vehicle. Otherwise, the enclosed car transporter would likely lose money. When Does It Makes Sense To Ship Your Car Enclosed? If a customer is shipping a vehicle worth over $75,000, he should ship enclosed carrier for two reasons. First, why take chances with something so valuable? Consider enclosed transport an extra insurance policy. Second, we know that open car carriers shy away from hauling very expensive vehicles because of the liability they incur. If given the choice between a $35,000 Honda Accord or $85,000 Audi A8, an open car transporter will choose the less expensive every time if the payday is the same. There would have to be a significant, maybe $100 or more, difference in order to coax the open carrier into taking the risk on a very expensive vehicle. It is better for all involved to ship $75,000+ vehicles enclosed transport. Low ground clearance vehicles of 4 inches or less should ship enclosed carrier. That’s because low ground clearance vehicles will likely bottom out if driven onto an open carrier. That might damage the undercarriage of a vehicle. Nobody wants that. The enclosed car carrier comes equipped with a lift-gate for easy and safer loading. Some collector cars are simply difficult to replace. They should use enclosed shipping for obvious reasons. But another consideration that open car carriers employ is whether a vehicle is capable of making the trip? Older cars might have loose parts that may fall off or get damaged simply by being on an open carrier that is frankly banging and vibrating down the road. Older vehicles, even if not worth much anymore, can be a liability and open transporters will choose more recent year models to haul instead. Unless a customer does not really care, which is hard to imagine, it would be wiser to ship any vehicle older than 50 years enclosed car transport. You may get a quote to ship your car open vs enclosed by going here to the Direct Express Auto Transport homepage or call 800-600-3750 to speak with a customer service representative during normal business hours.